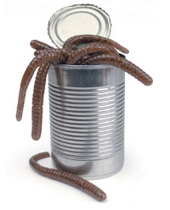 Worm Charming is one of those fundraisers that sounds a bit weird! But actually it can prove to be a great fundraiser in its own right or a neat side attraction at any other fundraising event. It's very simple. - A plot of land, usually a grass field or village green is divided up into small plots. In the UK it's called worm charming. It started out as a quirky activity at Summer Fetes. Several villages claim to have invented it and as well as smaller local fundraisers, annual championships are held at different locations around England each claiming to be the original. In America it's called worm grunting or sometimes worm gruntin' and comes from the tradition in some parts of the US of collecting and selling worms for fishing bait. There are even professional grunters! In both cases it has been taken over by school PTA's and other charities always keen to find novel and funny fundraising ideas. 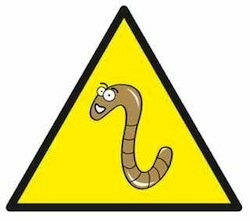 The plots - Most worm charming societies and fundraisers have found that a plot of 3m x 3m (3yds x 3yds) works best. The grid of plots is marked out with strings or by putting small sticks at each corner. Alternatively a friendly groundsman (with the machine that marks sports pitches) could do a really professional looking job for you. It is usual to allocate plots by lottery. The competitors - Some prefer to work alone but teams of two are common. This allows one to charm and one to collect. Fancy dress can add to the spectacle and make this one of those wonderfully eccentric and really funny fundraising ideas.Some competitors will use elaborate contraptions to encourage the worms to the surface others employ tried and tested techniques.Some others claim mystic powers over the worms! The worms - Must be charmed to the surface. Absolutely no digging is allowed. When enough of the worm is showing above the surface they can be carefully pulled out. All the worms are placed in a collecting bucket or cup containing moist compost. It is possible to gather a surprisingly large number of worms from a quite small plot. The record is over 500! The judges - The event is started and ended by the worm master or a local celebrity ringing a bell.30 minutes is considered to be about the right amount of time. Scrutineers should patrol the plots to ensure general fair play with no worm poaching and respect for the worms at all times! At the end their job is to count each competitors worms and declare a winner. After the competition they are also responsible for the safe release of the worms. The winner - Is the individual or team who collect the most worms from their plot in the given time. It is usual for them to receive a prize or trophy.The presentation of some kind of Golden Worm Trophy is a popular end to these funny fundraising ideas. Many techniques will work. Half the fun will be to see what people come up with. Organisers may like to provide a selection of tools for participants who did not come equipped for the challenge. A large number of people (including excited children) carrying garden forks and other potentially sharp tools around before and after the event needs to be managed. Competitors should be encouraged to bring tools in safe sacks or bags etc. A tool creche is also a good idea. Alternatively fence all the plots off and encourage people to put their charming tools on their plots prior to the start. Worm charming makes a great spectacle and if you really go for it will attract a lot of people to your event. It can also makes a great centrepiece or side attraction for your Summer Fair. Charge an entry fee. Most competitors will happily pay around £3.00 / $5.00 to take part. Make sure you have all your other fete stalls, raffles, tombolas and refreshment stands in place. Make a real afternoon of it. Don't forget some other funny fundraising ideas and activities for children. Painting worm pictures and making fabric worms from old material will add to the worm fun. Worm decorations on cakes and cookies and Fat Worm Dogs (OK a bit like normal hot dogs but who's asking) all add to the days takings. There are lots of easy ways to add your own "wormy ideas". Holding a Worm Charming Event is great fun and can be profitable. Give it a go! The Better Fundraising Ideas Home Page.